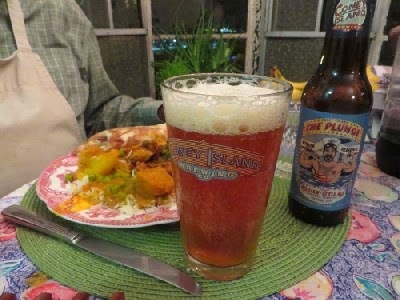 "The Plunge": Coney Island Brewing's winter seasonal. The Coney Island Brewing Company's winter seasonal offering is called "The Plunge", after the Polar Bear Club's winter swims at Coney Island. With a name like that it should be, well, bracing. The label says "Belgian-Style Ale with Ginger, Orange Peel and Fennel Seed." As I've mentioned before, I'm leery of brews with additives. To riff on The Lovin' Spoonful, "All I want is malt, yeast, water, and hops just to set my soul on fire." Still, despite initial strong doubts, I liked Coney's summer brew, Tunnel of Love Watermelon Wheat. I found their autumn offering, Freaktoberfest, less pleasing. Pumpkin is not one of my favorite flavors, although the espresso beans added an interesting note. The Plunge went well with the spicy curry, its own spiciness complementing rather than amplifying or fighting that of the food. All in all, a pleasant drink, and one I'll enjoy again. Would I compare it to a swim in frigid water? To me, it was more of a sitting in front of a fire on a winter's night kind of beverage. At 6.9 percent ABV, it will warm you up. Technical details are here.